This page is JUST. FOR. KIDS! Why are we talking turkey today? It's springtime. Thanksgiving is seven (7 !!) months away! Hey! 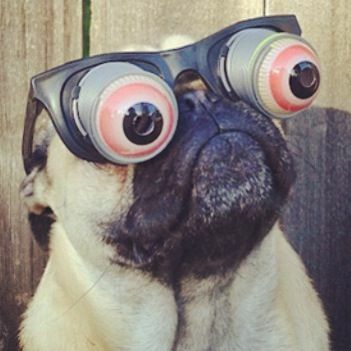 That googly-eyed pug dog looking at the googly-eyed turkeys looks a lot like Jean McMillan's googly-eyed pug dog! 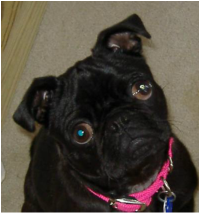 Her name is Polly, and she could stare down the blonde pug any old day. ​to go to the website ​that explains how to do it. This page is brought to you by our Assistant Editor, Jean McMillan. She's as crazy as a loon! 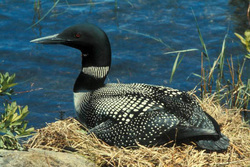 What's a loon, you ask? It's a bird. There's a picture of one here. loon sitting quietly above doesn't look crazy at all! 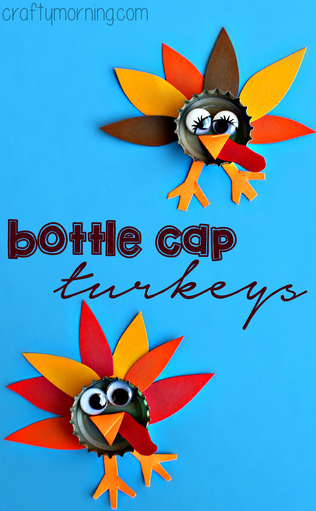 ​How about a BOTTLE CAP TURKEY? I'll bet you've made at least one turkey picture like this. No? Well, click on the picture to go to a website with lots of ideas for painting turkeys with your hands. You're probably wondering why we're talking turkey in the springtime. Isn’t the turkey an autumn bird, getting ready to jump in the oven on Thanksgiving Day and give your family a feast? In addition to gobbles, a male turkey makes calls (sounds) called spits and drums. The spit sounds like “CHHHKKK.” Try saying that – I dare you! The drum sounds – well, like a drum. Actually, a lot of turkey calls come not from their mouths (or beaks) but from deep inside their chest. Both males and females use cackling, purring, hissing, clucking, yelping and other noises to talk with each other, and wild turkey hunters learn to be very, very quiet so they can hear those sounds and figure out where the turkeys are. You can listen to wild turkey calls in the video to the left. Map courtesy of the National Wild Turkey Federation (www.nwtf.org). ​Click on the map to get a closer look at it. Early settlers in America began hunting wild turkey because they and their families were hungry. They cut down trees to build their homes and to have wood to burn so that they had a way to cook the turkeys and firelight at nighttime. That's understandable, isn't it? But the settlers also cleared the land of the trees and brush to open it for pastures and farming. When this happens the animals' home (habitat) is gone. It was when they began hunting turkeys (and other wild animals) and cutting down trees to sell to other people that things went wrong. In earlier times, people hunted and gathered their foods to eat. They traded what they grew or caught with other people. If they couldn't find apples, they traded their turkey (or other foods) with other people who had apples. When people begin hunting animals and cutting down trees in order to sell them for cash money, greed often takes over. They don't think about what will happen when the habitat and turkeys are gone. Wild animals need a place to live and food to eat, just like you and me. So the turkeys who didn't get shot had nowhere to live, and nothing to eat, and gradually they vanished. Organizations like the National Wild Turkey Federation and organizations with responsible hunters who care about the wildlife, have helped to bring back the turkey and other animals that are in danger. ​Turkeys have been talking for 11 million years. Yes, 11 MILLION! They lived all over North America. As early settlers traveled west across the country, they drove all kinds of wildlife (including turkeys) away from their homes. They hunted and sold turkey for humans to eat, and their feathers were used to decorate women’s hats, coats, and dresses. The turkey population grew smaller and smaller, until they were almost all gone. Eventually relocation efforts and hunting regulations helped the wild turkey population to thrive again, and now you can find them in 49 states (but not in Alaska). And then the turkey said, "GOBBLE, GOBBLE, GOBBLE"
ones like the turkeys we've been talking about today. ​and other animals in the Colonial times of the USA. wild turkeys ​and other animals in the Colonial times of the USA. And it's off to the races we go! ​In North America, there are five true sub-species of wild turkey Eastern, Merriam, Rio Grande, Osceola, and Goulds. There are two species of wild turkey. One type is originally from Yucatan and Guatemala and the other is from Mexico and the USA. Both types are strong fliers and among the fast runners. They can fly at up to 55 miles per hour for short distances and run at up to 30 miles per hour. Do you think they might win a race with an airplane or automobile? The answer to the riddle is further down on this page. 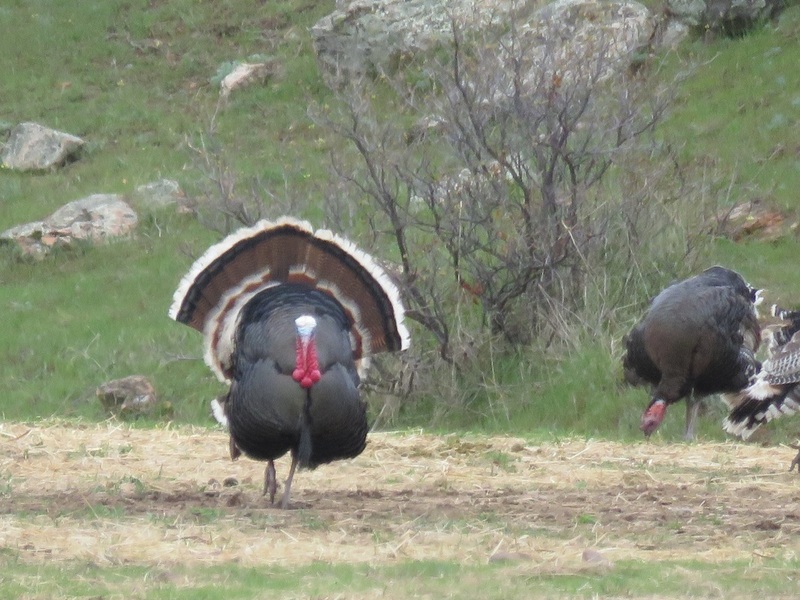 Ocellated tom turkey and hen. What has legs and can't open doors? Turkeys aren't just good food - they're good fun, too. ​You can do all kinds of cool things with turkey feathers. Here's a turkey tail fan using turkey feathers of a Rio Grande turkey and a turkey "beard" (that's the long piece hanging underneath the spray of feathers). 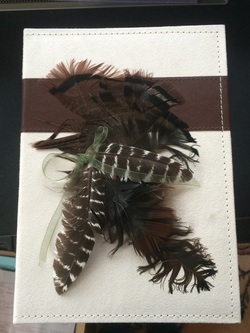 Personalize a photo album with turkey feathers and ribbon. All you need is a photo album, turkey feathers and craft glue. If you can get an adult to help you, a glue gun works well, but please don't use one on your own. Burns hurt a lot, and especially when there's hot glue involved. Traditionally, Native Americans believe that birds and their feathers can carry prayers to the Great Spirit (or God). They decorate the feathers with intricate bead- work like you see in these photos, and often give the beaded feather to a loved one as a very special gift. Above is a "Hellhat" - a riding Helmet + a hat, all in one. It's decorated with with turkey feathers, leather cording - really, anything you want. Go to Mary Lainhart's Facebook page to see how to make your own. This is a Goulds turkey. 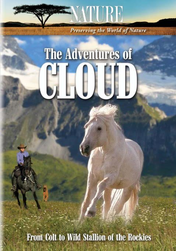 ​won the DVD, Cloud the Stallion. MAKAYLA ALWAYS WANTED A HORSE, and last year, her DREAM CAME TRUE! Makayla & Laci are smiling because Makayla and their mom adopted two wild mustangs. In August 2016, Makayla will be a contestant in the Youth Trainer Extreme Mustang Makeover. She'll adopt another mustang, spend 100 days training it, and then show everyone what they've accomplished. Read more about Makayla and her mustangs on the Trainer Tips page of this issue (click the photo to go there). 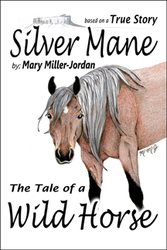 ​We'll be following Makayla's adventure in future issues of Wild Heart Mustangs™ e-zine. You're probably looking forward to summer vacation 'round about now, but Sweet Potato is still in school and working hard. In the February 2016 issue of Wild Heart Mustangs™ (click here to see it), we met Sweet Potato the Mule. His #1 human is Mary Lainhart, the big boss lady here at Wild Heart Mustangs™. That's Sweets in the photo to the left. Since then, Sweets has done some more growing, and in March he went off to school with his adopted brother Wakan and sisters Neehee and Clover. In the April 2016 issue, Mary wrote about her equine family's training and posted some photos of the kids going off to school. Click here to read the April 2016 story about Sweets and his schoolmates. Sweet Potato's teacher, Emma, has been sharing photographs of her student as he learns his lessons. Click here to read the latest update.